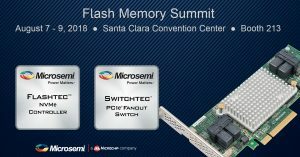 Empowering Gen 4 Storage at Flash Memory Summit (FMS). In part 1 of these articles, published yesterday, I talked about how safeguarding network infrastructure and storage systems is more critical than ever. In this article, I’m going to talk about solutions. Update – 26 Nov 2015 – Well things can move very fast in the Linux world when they want to! Since I wrote this article an improved, but still pre-production, version of the polling code for the block layer and NVMe driver have made it into the Linux kernel and will go mainline in 4.4. There is a really nice overview of how it works here and Jens’ patch-set comments and some of his testing results can be found here. It is worth stressing that the results we present should only improve as the polling mode evolves. Stay tuned for updated performance results in due course! I love SSDs! They have transformed the data center by providing high-performance, low latency access to storage. Low latency is transforming the data center stack. I will be digging into latency in my next few blog posts, starting with Driver latency here. Many of the customers I talk to have a fixation on port numbers. I find it a bit unusual because we tend not to have the same sort of fixation on anything else we do in life. The benefits of more ports seem obvious—my fellow blogger Dave Berry writes about how performance and capacity help data centers do more with less—but when it comes to RAID controllers or HBAs, we definitely have a fixation. For example: I have 2 x SSD – hmm, you don’t have a 2-port controller so I’ll look at 4-port instead. I’m not interested in looking at 16-port controllers because I’m fixated on the number of drives I currently have. That’s a shame because in fact it’s the 16-port controller that you need, whether you currently realize it or not. Our Adaptec team in Germany has put together a vendor lab where vendors, such as hard drive and SSD manufacturers, can bring their gear and test against our products. While we have validation testing going on all the time in other PMC centers, having the ability for a vendor to sit and play with the combination of our gear and theirs is getting people pretty excited. March 17-19, 2015 marked the first ever OpenPOWER Summit, which was held at the San Jose Convention Center. This was an opportunity for the 110+ members of OpenPOWER to get together and showcase the progress to-date in establishing an open CPU/server framework around the Power8 processor and sub-systems. At the same time, this was a chance for non-OpenPOWER companies to learn more about what members are trying to achieve and determine how best to work with this ecosystem going forward. We may not think about them often, but technical standards impact most aspects of our daily lives. Gasoline refined in California will work in a car engine built in Japan. Your phone charger plugs into an outlet in your office just as easily as into an outlet in a hotel room. And your bank card works in ATMs in Texas, Ohio, Florida, or wherever. The storage industry has its own set of technical standards, and PMC is actively involved in the initiatives and communities that lead to the development of standardized feature-sets. Additionally, we regularly participate in test events to prove out our latest silicon, boards, and firmware to ensure proper protocol operation in open environments. Our leadership and input have led to cutting-edge PMC innovations, better interoperability with other vendors and happy customers. What is an Archive Drive Anyway? Most of the Internet Moguls have been asking for a longer service life. This may be a MTBF of 3,000,000 going to 4,000,000 or a warrantee of 7 years. Either way there are some tricky bits to deal with when talking about an archive class hard drive. The point of this article is to understand what are the top factors that are important to a ColdStorage system. If you just want to jump to the conclusions, there is a section at the end for that, as well as the asks for both providers and consumers. While still at Facebook, I coined a phrase, ColdStorage. I also regret coining the term ColdFlash, but more on that later..
Is your ISCSI fast enough? iSCSI is a great technology. It gives you the ability to create SANs very cheaply and easily, without having to become a guru in Fibre Channel or put yourself into deep debt buying all the Fibre equipment. By using easily available networking equipment, you can add storage to existing boxes, even if you want to go crazy and do shared access, clustering or other high-end features. A lot of vendors provide basically free iSCSI targets (there’s even one in Windows Server these days), and almost every OS has a free software initiator to connect to those targets. Yes, we can bang on about whether software or hardware initiators are better, but software initiators are free and work so well that most iSCSI hardware initiator vendors have stopped bothering. PMC recently joined Canonical’s Ubuntu OpenStack Interoperability Lab (OIL), an integration lab where Canonical tests and validates software with multiple versions of Ubuntu OpenStack on different hardware configurations. When you’re in the business of high-density, high-performance I/O connectivity like PMC is, OIL is an important place to be. Canonical’s Ubuntu operating system and Ubuntu OpenStack are the most popular operating platforms for cloud and scale-out computing. Ubuntu is the hyperscale OS natively powering scale-out workloads on a new wave of low-cost, ultra-dense server hardware based on x86, ARM, and OpenPower processors. Can You Optimize Your Data Center Storage for Capacity AND Performance? With Adaptec by PMC Solutions, YES! I would probably need a data center to help me keep track of how many data centers I’ve visited across the globe. But no matter where they’re located, or what market they serve, they all have a common mission: to do more with less at the highest performance. Businesses and consumer demand for fast, reliable and secure access to data and content is skyrocketing, forcing data centers to add more and more storage capacity and maintain the high performance that their customers expect. After commuting in Silicon Valley for a few decades now, I can really appreciate all of the techniques that the IT industry has invented to improve Quality of Service (QoS) for data center infrastructure. After all, in the data center, like on our roadways, ever-increasing scale and density are the mother of all invention! As an early Hybrid Toyota Prius adopter, I was able to use the carpool lane and laughed at everyone else while flying by and getting to work three times faster due to my privileged driving and the improved the overall QoS I was experiencing. Rules change with technology advancements; now I watch the new electric cars cruise by in my former spot, and it’s painfully clear that big trucks cause the bottlenecks, so maybe the solutions is to let them have the car pool lane! In 2011, Andy Bechtolsheim highlighted the need to think about TCO with a famous economics quote, “Over the long term, absent of other barriers, economics always win.” Andy, of course, is a Silicon Valley legend, and talking economics provided insight into his total approach to innovation. The analogy clearly applies in the data center for storage as the explosion of Big Data arrives. Data centers deploying storage at scale for workloads like Hadoop Big Data Analytics or OpenStack Infrastructure as a Service (IaaS) need extreme capacity and performance/$ that a common 8-port HBA or adapter just can’t deliver. To get there, you need to redefine how a rack can be architected.